Write the stories you wish to read in the world. Hey, folks. It’s been awhile. I’ve been doing a lot of personal work while facing significant challenges, health and otherwise. One thing that I find therapeutic, and healing, and also fun, is filking. I can’t read music, but I sure can carry a tune. Like I said in my last Million Words post, I always have some song or another in my head. That’s why it’s so easy to filk. On that note, I absolutely adore Taylor Swift. As a person she’s an inspiration, and her songs are always so fantastic. So it was fun to write this parody filk of “Blank Space”. And much like the I Will Survive / You Oughtta Know mashup I created last year, crafting this felt right. Edit April 18, 2019: Somehow, I, um, forgot half the chorus. That's been fixed now. Needless to say, it was a productive afternoon. 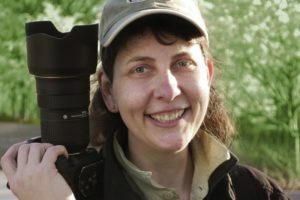 Melanie Otto was an amazing person, a bright light that I am honoured to have known. Quirky and wise, she was amazing woman and an excellent founding member of our retreat group, the Roaring Writers. Late in the fall of 2016, she was taken by an aneurysm, leaving her partner with extensive medical bills. For ages we’d been batting around the idea of a group anthology but couldn’t decide on a theme. 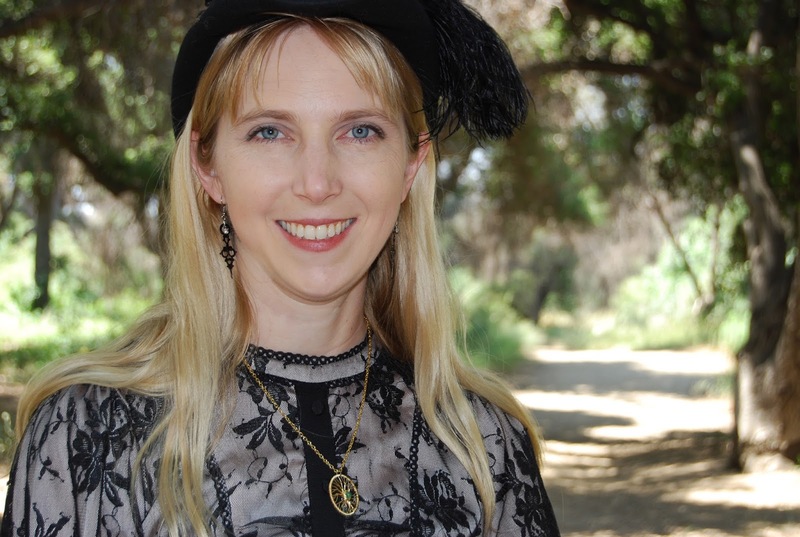 After she passed, we knew what we were going to do: contribute pieces that we Melanie loved when she read them, or would have enjoyed because her delighted laugh was ever-present on our retreats. Thus Chasing the Light was born, and the decision to donate all proceeds to help her partner with the bills was unanimous. I hope you’ll enjoy this collection, which is filled with short stories from across the science fiction and fantasy spectrum, and includes contributions by all of the Roaring Writers and the award-winning authors who’ve taught us. Check it out today! The glass-and-chrome behemoth on the office kitchen counter loomed with all the pretention of a wealthy hipster. Not surprising, given who’d acquired the monstrosity after the old microwave kicked it last week. Tiffany was on another of her holier-than-thou cleanses, and something like this seemed to fit with her litany of kombucha, quinoa, and kale. But I was starving, I’d timed my break to avoid Princess Probiotic, and my lunch was in serious need of therapeutic radiation, so I didn’t have much choice. Right. The microwave. She’d made such a grand gesture of donating it on Friday—right before declaring yet another holy war on processed foods. How could I forget? I glared at the back of her twin-set as she strode off. There she went again, trying to force everyone to conform to what she thought was best. Dammit. Svelte and fit she might have been, but Tiffany was the biggest cow I knew. What was it about losing weight that made a person think they were superior? As if we were all failures if we didn’t kowtow to her ideas, do what she’d done just so we could be as “successful” as her. The sad thing was, for the most part, everyone in our department had fallen in line—even our boss. Not that Milo was much for conflict. Ever. And so Tiffany and her quinoa reigned supreme. While I stuck to the one defiance I could still get away with: my lunch. So what if I spent more on eating out and facial degreasing than clothes? A pang in my belly reminded me of what really mattered. I stuck my food inside the machine. The door closed with a clunk as it locked, and I studied the rows of buttons on its not-so-standard panel. Oh, the usual options were there. Cook. Power level. Clock. But one button in the panel’s lower left corner struck me as odd. I snorted. Clearly the machine’s creators had a sense of humor. And then I thought, Why not? The faster I could enjoy my calorie-laden therapy in peace, the better. I punched in ninety seconds, hit the button, and popped into the nearby washroom. I’d heard the microwave beep while I peed. The office walls in our department are pretty thin, and the kitchen produces a linoleum echo not found in the rest of the carpeted halls. But when I returned, the room lacked the distinct mouth-watering scent my greasy leftovers usually produced. 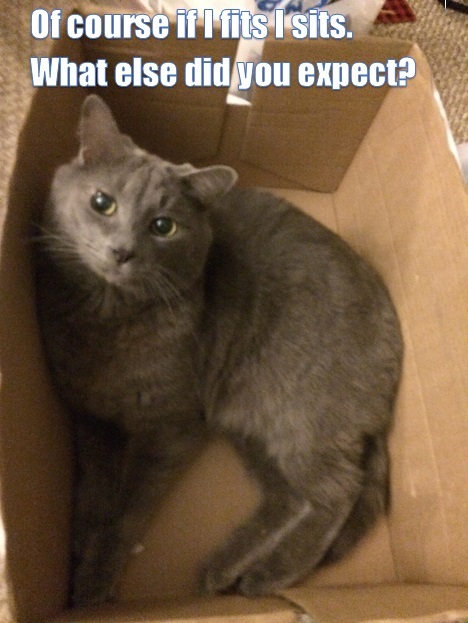 The box was gone. In its place was a dense green mass on a squarish glass plate. I eyed the palm-sized glob, cold with disbelief. That was not my chow mein. Whatever the hell it was, I sure didn’t want to call it “food”. My latest contribution to The Million Words talks about rhythm and voice. 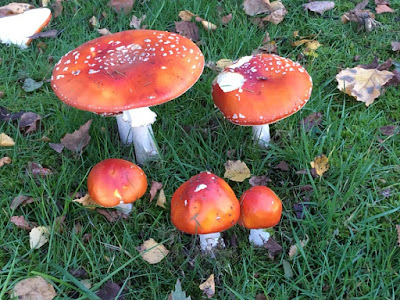 My lovely retreat group and I have started a blog together, called TheMillionWords.net, where we talk about our journeys and the lessons we've learned along the path to publication. Here's my contribution to the launch. 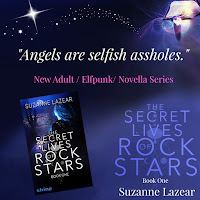 Today I'm delighted to host a stop on the YA Bound Book Blitz for book one of Suzanne Lazear's new adult elfpunk novel, THE SECRET LIVES OF ROCKSTARS. I absolutely adored this book. This is the kind of story that had my writer's brain working overtime, wondering what was going to happen, and even projecting predictions for book two. There was humour, quirkiness, and an enthralling plot. And one of the neatest aspects of the was the drakken, a race of dragon-like beings with an exciting cultural heritage. 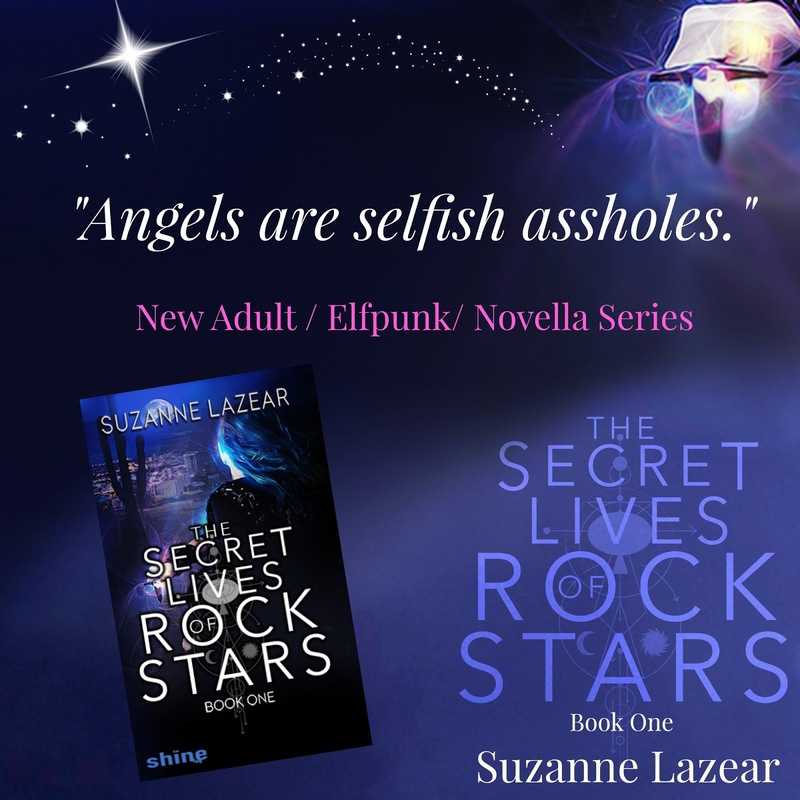 Here's what the author has to say about it in her own words. One of my favorite things about THE SECRET LIVES OF ROCKSTARS is that it has dragons—or drakken as I call them. I love dragons and had been itching to write a story with them. My drakken are shape-shifters. Once, they lived in this realm, but moved to their own parallel realm as the human population grew, which is why there are so many dragon stories. My main character, Bitsy, has to stop a demon-fueled war before it harms innocents—and before her band, The Freakshow, leaves Tempe, Arizona, for their next tour stop. She was also raised by crazy drakken, and years later is still trying to deal with everything that happened with her. “Drakken,” I corrected unthinkingly. “Dragons are creatures in human children’s stories.” Drakken were a shape-shifting people who now occupied a magical realm parallel to ours, but most liked to travel back and forth. Being trapped in the human realm unable to return to the homeland was a pretty serious punishment. Serious enough to burn everyone alive in an attempt to get back. “They weren’t my friends. And I have nothing against them.” Nothing I wanted to talk about. I knew the crazy exiled Drakken who raised me were very different from most, but I didn’t like advertising my upbringing. Drakken love books and learning, and often come to this realm to attend college. The Freakshow’s current tour stop is a college town. Not only does she run into a few, but if she’s going to stop the chaos demons in time, she needs help from one, Eric. The drakken are organized into tribes, and different types of magic are associated with them, however, there is plenty of crossover due to inter-tribe marriage. Eric is western tribe, an earth drakken. Eric has earth magic. Bitsy’s foster sister had been northern tribe and a mistress of lightning. However, the place she and her foster sister grew up in had been run by exiles. I also gave the drakken their own language. I tried to use it sparingly, in ways where you wouldn’t necessarily need translation. The words just slipped out. Old habits. “Na’i te.” Eric smiled; it was the kind that put people at ease and made girls lose their morals. “You speak my language?” he said in Homespeak, the common drakken language. “I just know some,” I replied in the same language. Lies. It was my first language. We never spoke much English in the compound though my foster mother insisted we learn it. Well. The word dikka, outsider, made me flinch. “No offence taken.” I closed my eyes for a moment to help choke back the voices in my head. At the compound it was an insult and I’d been called that far too often as a child, usually with satta, stupid, in front of it. I wasn’t ever smart enough. Or fast enough. Or graceful enough. Or had enough magic. Most of all, I wasn’t one of them. And never, ever would be. “Kai’kien, please…” he murmured, hovering over me. “No, really, it’s okay,” I muttered in English, just wanting him to go away. Each tribe has different customs. Also the different tribes and their customs loosely relate to where they came from in the human realm. Drakken are telepaths, especially when in dragon form. Bitsy can hear them just fine. They are also very polite and have a very elaborate culture. Taking a teapot, she filled the cup with red-brown liquid, steam rising from the surface – but the flame kept burning. She handed to me. I hesitated. This fire can’t hurt you. The cup in one hand, I waved the other over the flame three times, blew it out, murmured kin’ba, and took a drink. The sweet-tart liquid burned my throat in a way that brought back memories of cold afternoons, late night tea parties, and tiny cookies shaped like snowflakes. “Ses’ba,” she added quietly in the background. Both these things had no translation; it’s something you say when you drink. There were a few of those phrases in Homespeak, but my foster mother always insisted we use kin’ba. She never told me why. But she always did things differently than everyone else in the compound. “Excellent, my complements to the chef,” I told her. The preparation – and serving – of haeibo was an art. My sister always made it look like a dance. My klutzy self had been banned from even touching my foster mother’s precious teapot. Eric’s enthralled with the fact that she knows so much about them. Since most of Bitsy’s memories of the drakken aren’t fond, she’s not too keen on this. The drakken also have their own religion and goddess. Bitsy hides it, but still practices their religion, given it’s what she knows. Yes, She was. The question was, why? Again, he stood too close. I could smell his Drakken scent – mainly books and brimstone. “Sometimes I feel the same way,” he whispered. I had a lot of fun creating the drakken culture and writing Eric—especially scenes between him and Bitsy. 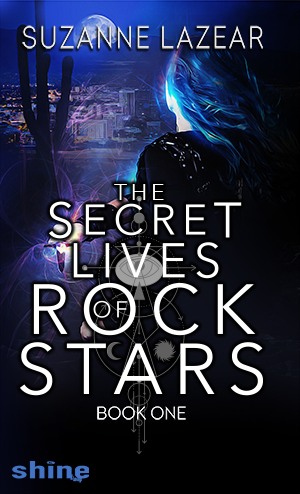 I hope you enjoy Eric, the drakken, and the adventures he, Bitsy, and everyone else have in THE SECRET LIVES OF ROCKSTARS. If you were a dragon what powers would you have? .As I said in my previous post, there's been a lot of Stuff going on for me lately. Enough for me to have a personal investment in this initiative, even though this is nonetheless neither the place or time for me to discuss particulars. But this topic is important. The Mental Wellness for Writers panel at ConCarolinas this June was heartfelt, honest, raw, and hands down, my favourite one this year. And out of respect for all who participated and shared, it's not one I'll ever take notes at. Timing's a funny thing, though. I had recently written this scene during revisions to my novel, SIGN OF THE STAR, which will be on submission soon. And it felt important to share. Background: A princess with healing powers who escaped murder as a child must choose between being the healer she wants to be and the country that needs her. When she encounters a fugitive nobleman seeking the lost princess, circumstances force them to travel together, and she learns that guarding her secret also means guarding her heart. At one point the two are kidnapped, but before they can escape, the bandits are attacked by a warring group. As a servant of the Land, Janni must deal with.the aftermath—and its consequences. Lingering tendrils of clouds, violet-edged with the last of sunset, curled about distant peaks, clinging to them like smoke capped a fire. My stomach turned. I tasted bile. Grimacing, I glanced away. “Are you all right?” Concern tinged Brennant’s voice, as it had since we left Karovar. I ignored him and focused on the road ahead, pressing onward. Shoving away thoughts of the pyre smoke’s stench, of copper and musk, acrid and sweet. Hmph. Likely Hush would have purred her agreement, but the puma had already gone off to hunt. I kept walking. Away from the ashes of our work. The grim task I’d suggested, and now wished I could forget. Days had passed since we’d left Baesh, and yet the mindless slaughter still ate at me. The morning after the battle, building the pyre had consumed the rest of the daylight. None of the dead had been less than half the chief's massive size, and all were far too heavy to drag on my own. Brennant saw my struggle with a corpse and rushed to help me, but then Baesh cursed and sent me into the woods to gather deadfall instead. And when we were ready, both men looked at me to speak. I opened my mouth—and faltered. This was no Deathswen ritual, where the names of the newly dead were spoken to honour their memory. There were no loved ones to mourn their passing, no scribes to log their fates. “We stand before the fallen,” I said, grasping for what words I could find. “Soldiers and captives, worthy and wicked. As we release them from the Land into the sky, may their souls find peace.” Spreading my hands, unable I looked at Brennant for help. With that, he set the pyre alight. The bodies burned until dawn. None of us slept until noon. Brennant and I stayed another night at the clearing, too heartsore and worn to resume the journey at once. At least, that’s how I’d felt. The next morning, Baesh had taken us as far as the northern Karish border, where the wilds and some semblance of a road resumed at last. And I still couldn’t shake the ghastly scene, that cloying reek of the dead, from my mind. “Janni.” He sped up and grabbed my wrist. “Night falls quickly around here. You should have noticed by now.” He spread out his cloak, all he had left of the things he’d bartered from Derva. Everything else had been lost when we were kidnapped. Had to get to the vision-lady and her people before anyone else suffered. “Then catch up with me tomorrow.” I strode away. That halted me in my tracks. How dare he. There. I finally said it. The truth I’d been holding in since the pyre, since the attack. I collapsed to my knees, my pack hitting the ground with a thud. “That doesn’t matter. All that death—” I choked back another sob. I bit my lip. The words were a platitude he’d probably picked up in the priesthood, but Zira had often said the same over the years. I never quite understood; I was a healer, not a fighter. But maybe that’s what they meant. I could help people. That’s all that mattered, and why I’d made my choice. 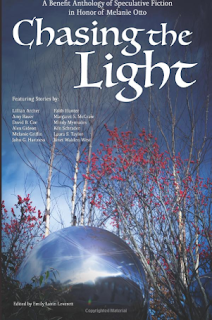 To find out more about #HoldOnToTheLight, find a list of participating authors, or reach a media contact, go to the #HoldOntoTheLight Facebook group; or, check out the website or Facebook page. So it's been awhile. Definitely a lot longer than planned. But when Stuff begets Other Stuff and one's world implodes just ever-so-slightly, and then one finds oneself the unfair target of several negative people in multiple areas of one's life, and then one starts to question one's own sanity, until numerous others come forward and confirm that no, one is not imagining things... well. It has been an interesting summer. Complaints have been and will be filed. And at least for one of the situations, my next filked song will be, "Screenshots Are a Gir's Best Friend". You read the title of the post right: this is my last set of notes from 2015 that slipped through the cracks in my rush to edit a manuscript and then subsequent jetsetting, attending my sister's graduation then flying to this year's ConCarolinas and my writing group's retreat. I exhausted my spoons but still came back creatively invigorated and refreshed. Today's topic is very appropriate, since this is nothing if not Difficult Topics week here. Coming in a few days will be my contribution to #HoldOntoTheLight, the mental health awareness initiative from SFF authors and bloggers. (Hey, might as well go for the stuff that matters.) The authors here bring their experience writing about characters with disabilities, and in some case, dealing with their own issues. This is another important facet in the movement for diverse books. Enjoy! Why would you choose to write about disabled people? RC: It’s important to get a good read on the story. It’s hard when you can’t function the way you believe you should function. Wants to be able to relate to something. LH: The story she wrote, the story structure, the deaf character came to her, and that diability became an ability. DR: Husband came back from Iraq after two deployments, with a massive brain injury, and ptsd, and going to the VA, talking with other soldiers, felt like people wanted to pity them rather than seeing them as they really are. People see the scars, the injuries, and she shows in her books that they have to learn a new way of life and are not to be pitied. They don’t want a handout, they just want to learn to do it differently. AW: The people are people, and don’t want pity. What actually entails a disability? (Thinks it’s rude to say “differently abled”) What does comprise a disability and what are things not a disability? RC: Anyone who has a physical or mental roadblock to be able to function the way society generally would. LH: Skewed viewpoint, as an attorney: disability specifically defined in law, something that impairs a major life function. Not reading glasses, but yes special eyewear for legally blind. Looks at what people can do, not what they can’t. AW: Saying something is “differently abled” is condescending to him. What about injured soldiers? Do you agree, DR? DR: Agrees completely. Helped husband retain his right to his own power of attorney because it means more to him and her. AW: Yes, disabilities are part of who disabled folks are. But that doesn’t mean it’s the only thing about them. LH: The key is to write about it respectfully. If a not-nice character in your story has a certain characteristic, some readers might not like it. Everyone has logic, even if the logic is illogic. AW: If you’re going to write someone with disability, acknowledge the disability, but that doesn’t mean you should spend much time with that disability if it doesn’t do much in the story. What is the point of the character? How much time do you spend working on the disability in your characterization, and how much on the rest of the story (unless you’re making a specific point)? DR: Just treats it like another characteristic. Yes he has a missing arm, but it should just be a thing, not the focal point that impacts the story. RC: Trying to find the line, just because a little point is a fact in the character’s life. Unless that’s exactly what you’re writing about. LH: Latest issue of Discover – about echolocation in visually impaired in the real world. Different btw people born with sight and live that way, but the earlier you lose your sight, the more skilled you are at echolocation. DR: An accident required a corneal transplant, couldn’t see well for a few years, had to rely on other senses and found ways to work around that. If it serves the story … how could you best portray a disability without being condescending or overly detailed? AW: Not about the disability, but about something else. LH: Jamie Lannister’s story arc since losing his hand, it’s the impetus for his character development. Can you imagine a situation where a typical disability can prove to be the benefit necessary for the continuation of the story? DR: Social awkwardness – with disabilities in general, when soldiers are scarred or injured or hurt, there’s the emotion, the anger, the self-pity, and they do lash out. You can’t just write a perfect hero, you have to write their mental and physical attributes because of what happened. Can cause destruction of a family, of a person who’s gone through it, and it’s hard to see a person who was so vital before drawing away from life in general and you’re trying to pull them out and you’re feeling a desperation. It affects the people around them, too. How would you write folks with specific disabilities? RC: Probably would, but what’s hard is that people can only relate to people who are different to a certain extent, and if the story’s not entirely about what they’re facing, then readers can’t entirely connect to the stories because it’s hard to understand what others are going through. You empathize the most with the people you can relate to most. AW: If that’s just one facet of his personality and the rest of the character is interesting by themselves, you can definitely deal with that. Don’t dwell on it, but let it be a subtext that makes the character richer. Aud: What if the purpose of your story is to open up your reader to the difficulties of a character? DR: Sheldon is socially awkward. But as the show progresses, it shows different people opening up. Showing how nerds are just like regular people. A colour of a skin, a person’s social awkwardness, if you take a moment to learn about it, it gives your reader something to mesh with. It opens up the story to the readers. AW: The first thing you have to do is give them only one problem and not seventeen. Limit the number. One disability, even if that’s not true, is something you can focus on and clarify, so that otherwise your character is sympathetic, someone you feel with them (not pity). So don’t layer on several things at once. RC: Beyond sympathetic, don’t need to have too much. One thing at a time because a lot of people start to instantly feel guilt if there’s too much the person is suffering from. LH: Not much into message literature. But there’s also a social issue of whether or not can a person of one race or ethnicity truly write about someone of another race or ethnicity? John Hartness “The White Guy” and learning to open his eyes, Alice Walker’s scathing essays – LH disagrees, thinks it can be written. Whether it’s race, gender, ethnicity, disability, write it. Do it respectfully. And if it’s something you understand personally, then all the better. AW: If you want people to be sympathetic to the character, having some knowledge helps you write it better. LH: And if you want to write something amazingly controversial, make a sff world and put those differences, and it’s amazing what you can get by with. DR: Speaking as an African American, you don’t write them differently. You just write them as you would any other character. RC: People aren’t stereotypes. When you come to mental disabilities. The only stereotype you see of women with mental health issues is the “one type” of “crazy lady”. You rarely see women with legitimate mental disabilities. Audience Question: What should we do if we want or need to include a person with some kind of difference? How do we portray that person: ignore it, accept it, or is it something that can affect the story? Show how they’ve overcome it? Audience Question: Are characters with disabilities more prevalent these days? AW: Less of a shame, less embarrassing, because we’ve been working on this for a very long time. It’s easier now to put them in fiction. If you’re embarrassed about somebody’s differences, you shouldn’t be including it in a story. LH: A trend in calls, stories about people with disabilities, people “underrepresented previously in literature”. If you want to writer about an unrepresented population, now’s the time. Know people. Talk to people. Pay attention. DR: Check out Michael Stokes Photography. AW: We’re all still people, and that’s what we’re writing about. Stories with people. Hey everyone! I've hardly been home the past few weeks, owing to sisterly graduation followed by ConCarolinas and my writing retreat. So I'm sitting here in the late North Carolinian afternoon, thankful for the air conditioning and resting after some great conversations. JS: Heroes anthology: “Anything but white dudes in tights.” Also, as she’s in the marines which are 90% male; she’ll be deployed this summer as a commander. She feels that she represents all women in the marines because of the disparity. AJ: Has a lot of problems of the way people represent the British, English, and British/English people. Still wrong, and operates on the assumption that “anything that doesn’t look or sound like me is not real”, not a fully developed person, etc. Doesn’t like the automatic equate of “You must live in a thatched cottage, etc”. MG: She’s an English teacher, so she sees a lot in fiction and nonfiction of the stereotype that bothers her the most: the dumb hillbilly. A lot of times people think that because you came from a small town, you can’t be intelligent, can’t hold a meaningful conversation, and do nothing but make babies with your cousins. FH: Doesn’t like the Polyannas. Women being stupid with their strength, or being weak where they could be strong. DK: Doesn’t like the damsel in distress; or the sitcom with the unintelligent overweight husband and the smoking hot wife. (You’d never see the reverse show). And on the Disney channel, the children are brilliant and the adults are stupid and the children have to save their parents. JS: Worked on Capitol Hill when Don’t Ask Don’t Tell was being repealed, and the stereotypes and misconceptions, the fears that were going to arise, among the older generation. JS: Let’s discuss the F Bomb: Feminism. AJ: Someone who thinks that women should have equal rights to men. JS: Equal rights for everyone. Equal pay. JS: So what are the stereotypes? - The concept of the other. - That the mentally ill are dangerous to others; usually, they’re a danger to themselves. It’s okay to be a stereotype if that’s who you are. But most of us are not. We’re an amalgamation of everything. But we have stereotype because of laziness, lack of understanding, and snap judgments. - JS: Like I’m the hipster feminist who hates all men and burns her bra. - FH: I used to burn my bra. I gave that up. - JS: I’m wearing one today. I can’t stand it. - AJ: I like them. - JS: Stereotypes exist because of society. - MW: Because people prefer the shortest explanation ever. - DK: Because early-on in our development we needed to identify “this is my tribe, that’s another tribe” – that it’s encoded in our DNA to look for differences in people. - MG: Jungian archetypes. We do it to help ourselves understand, because in order to learn, we have to connect. - Audience comment: The Identification of friend or foe. - FH: When we create characters, the easiest way is to start with a stereotype and work back from that. If only needed for one scene and one purpose, you don’t need much more than a stereotype. But characters you build on, you pull away from that. It’s the individual traits that make them stand out. - MW: If you only write an antagonist that’s just opposed to the protagonist, then that’s a stereotype. But if you ask why, even in one sentence, you can make them more. - Sometimes stereotypes are good. Put in aviation because her supervisor found out she had a motorcycle. “Because you’re a little bit crazy.” But if you don’t use more than the stereotype, that’s when things go wrong. - MW: His vampires want to “pass” among humans. The concept of “passing” is a form of social engineering, inhabiting a stereotype to make people stop thinking about you. Stereotypes are good when you want people to stop thinking about who you are. - AJ: Whenever we deal with anything historical. We have a bad habit of saying, “100 years ago, everyone believed, “[something stupid]”. Not necessarily true. Not everyone agreed back then, either. So why do we assume in the past that it was somehow easier? - JS: We like our categories. It’s what we do to classify and categorize books. - DK: In Star Wars, assuming the whole planet is a desert planet, an ice planet, a forest planet, etc. We like to avoid stereotypes. Like “strong female character” just means “realistic woman”. And often with our first character, we base it on our selves. Why? - Because we know ourselves, know how to base things on ourselves, know how to write ourselves without stereotype. So how can we overcome this fear of stereotypes in our writing? - MG: Conversations. Talking about it. Openly, non-judgmental. Getting to know people helps a lot. - AJ: Once you’ve decided someone’s an ethnicity or gender, creating an actual life for them, putting aside those concerns and writing them as a character first. Wants to put himself into that character first, and then ask others in beta-reads for feedback later. The moment you ask, What do women want, women like? you’re already screwed. With writing, what we do is an act of empathy. Putting ourselves in someone else’s skin. Your capacity to put yourself in that position is always going to be mediated by a sense of strangeness. - DK: If your character is playing with or against type, there’s likely a very good reason why they do it. Maybe it’s not shown (the deep part of the iceberg), but as long as you know it. - FH: But you can use the stereotypes to show how a character is non-stereotypical. - JS: That’s a lot of big words for a southern lady. - FH: I bought me a thesaurus last year! Audience Question: What’s the Difference Between Archetype vs. Stereotype? AJ: Archetype is about character function. E.g. the threshold guardian. But a stereotype is something based on a set of social expectations of a particular type. MG: Sometimes the stereotype can come out of an archetype. MW: And stereotypes are at the expense of someone, penalize someone. Archetypes explain someone. JS: When they wrote Tomorrowland, the script called for a white male as the protagonist. Disney has wisened up. Cast a teenaged girl instead, and changed nothing about the story. It became Terminator as done by Disney with a happy hopeful ending. FH: Just says, “I’m not white.” And that usually shocks people. Her grandparents had to pass, and hid this from their children. She’s a stereotype, and she’s not. AJ: Next year has a book from Tor with a 17-year-old female person of colour protagonist in a South-African like country. Says, “This is a fantasy world that looks a lot like Africa, but it’s not, and he’s the only one qualified to write this character, but he’s not.” Writing is an exercise in empathy. He’s doing his best to do his research, ask the right questions, and all he can do is give it his best shot, and see what happens. It’s scary. AJ: Most of us have been in situations where we were out of place, not what people expected. Knows some of the strangenesses that arise from that. For example, he comes from a lower class, and was judged because of that at university. JS: This panel could go on a long time, because this is such a big topic. All notes shared with permission. Notes are posted ... eventually. I have a Bachelor's degree with a major in Geography and a minor in English, and a library technician diploma. I work an amazing job providing alternate-format textbooks to college students with print impairments. I have one science fiction short story published, but I write YA Fantasy because that's where my heart lies. My motto is "Write the stories you wish to read in the world", because if you're not writing something you'd personally want to read, then why would you be telling that story in the first place? I'm a geek and proud of it. I also occsionally filk and take weekly swordfighting classes. Laura Sheana Taylor, 2011. Ethereal theme. Theme images by mammuth. Powered by Blogger.